The symbolism of the four blue stars on Arkansas flag is explained. The state flag of Arkansas includes an explicit reference to the Confederacy. The overall design can be seen as having similarities to the Confederate battle flag of the American Civil War. 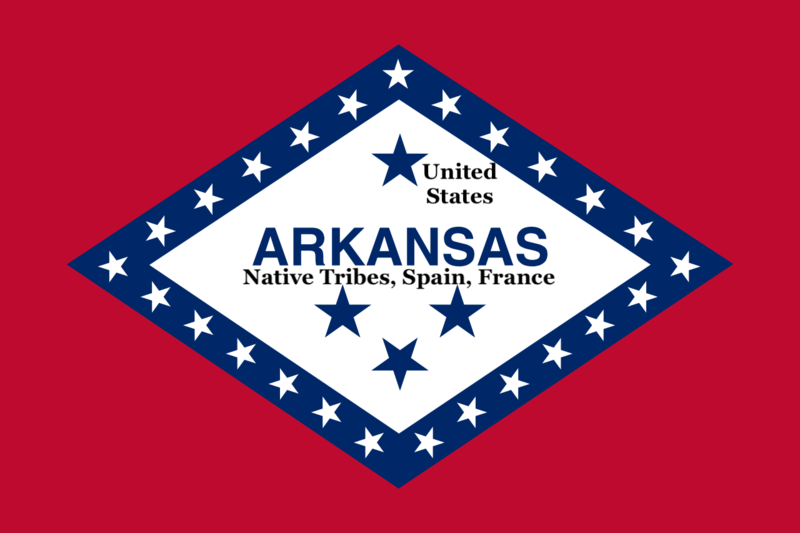 The early 20th-century legislation establishing the banner sets four large blue stars within the diamond to refer to the nations to which Arkansas has belonged: a triangle indicating Spain, France and the United States, and separately and uppermost the Confederacy. During the 2019 General Session of the Arkansas Legislature, a Democratic Little Rock representative proposed dropping the Confederate reference and making a star symbolize the indigenous tribes that dwelled here before the European conquests. It was twice defeated in committee. Why take the state’s word on such a matter? Why not as citizens proclaim the four blue stars be both inclusive and accurate? This detail might not make a sanctioned state history textbook, but a nongovernmental group could promote an alternative symbolism in defiance of accepted and prejudicial dogma. Local 965 of the American Federation of State, County and Municipal Employees approved such a resolution March 28, 2019. The rationale is that nearly all Local members are directly and indirectly workers in education. A modern flag is a teaching device, presenting facts and concepts. Educators have a vested interest in symbols that we use to impart knowledge and values. That Local 965, AFSCME, promote a fair and historically accurate representation of the official Arkansas State Flag. In 2019, the honorable state Rep. Charles Blake, D-Little Rock, lost several legislative moves to repurpose that fourth star to represent Native Americans. The top star would mean the U.S. and the lower three the previous sovereignties. We endorse that representation. We workers, standing for the people of Arkansas, proclaim that our state Legislature has limited authority to embarrass us. If anyone asks, and even if they don’t, we will loudly and proudly state our heritage from the dawn of recorded history as represented in the central four blue stars within the diamond of the banner. If state authorities beg to differ, well tough.